Every year, the members of the Lawrenceburg County Classic Car Club hold a car show. And each year, a charity benefits from the proceeds. Chemo Duck was one of the lucky groups thanks to Vern Green, vice president of the club. When it came time to talk about what charity would be the recipient of the car show’s profits, Green packed up a couple of ducks, gathered some literature and hauled them to a club meeting. He was interested in sharing what he had learned about Chemo Duck. His daughter, Jennifer, worked at the Monroe Carell Jr Children’s Hospital where Gabe Sipos received his cancer treatments. After learning the story behind Chemo Duck and how the program helped children fighting cancer, he wanted to see if his club could help. The annual car show, now in its 34th year, attracted 100 entries of classic and collectible cars, trucks and motorcycles. 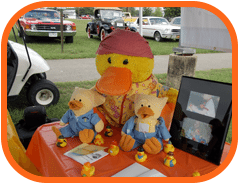 He asked representatives of Chemo Duck to set up a table during the show to help educate the car aficionados about the purpose of the stuffed animals. The club donated $2000. “We did pretty good,” said Green. “With what we donated, the folks with Chemo Duck said they will be able to buy and send out a few ducks and then some.